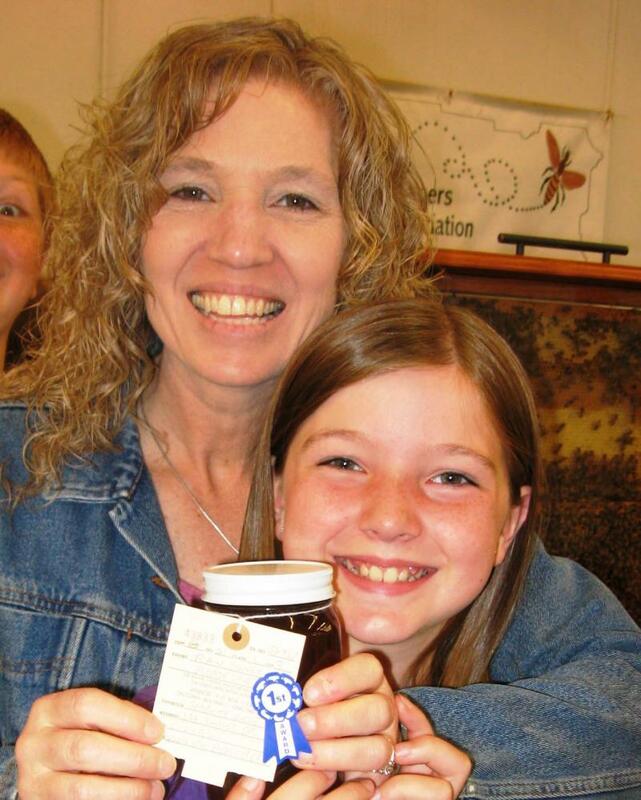 LCBA hosted 2 honey contests at the 2013 Southwest Washington Fair. The official Fair competition, in the agricultural division, assessed color, moisture content, & related criteria (click here for details). The "People's Choice" tasting focused strictly on flavor. Below, ﻿photos from our Fair competition; People's Choice pictures, at right. Above, Sharette Giese & Alesha pose with their first prize entry in the dark amber category of the Fair's official honey contest: the Gieses' "Woogie Bee" honey can be found at the Chehalis Farmers' Market (click here for details). Above, top entries in the dark amber category: 2nd prize went to Gary Stelzner & 3rd to Kevin Reichert & Grant Inmon. Our 1st prize amber honey was submitted by: Dave Gaston, Ben Moe, Guy Priest, Kevin Reichert, Sarah Roebas, DeAnne Schlumpf; below, veteran beekeeper Roy Schaafsma served as judge. Below, to the left of the observation hive, a light box built by Dave Gaston sheds light on the difference between highly processed / filtered honey & the raw, unpasteurized honey judged at the Fair and tasted by visitors to LCBA's exhibit. Raw honey has a faintly cloudy appearance ~ pollen remains in honey that has not been filtered to excess. To learn more, visit our Honey page, or click here. Above, visitors sampled 14 varieties of local honey at LCBA's "People's Choice" honey tasting, Saturday, August 17, National Honey Bee Day. Many visitors commented that even similar-colored honeys tasted very different: honey's taste reflects what forage the bees consumed, making each local honey a unique reflection of the bees' environment. On the left, Kevin holds the first prize winner, a dark amber that garnered 29 of the 180 total votes cast; on the right, Grant holds the amber that tied for 3rd place with Tim & Sharette Giese's dark amber [winner of the official Fair contest]. 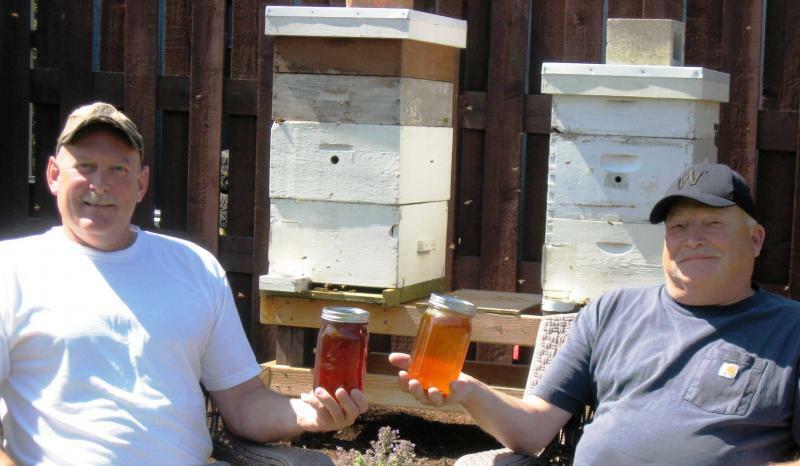 Both varieties of honey came from bees hived from carve-outs in spring 2013. 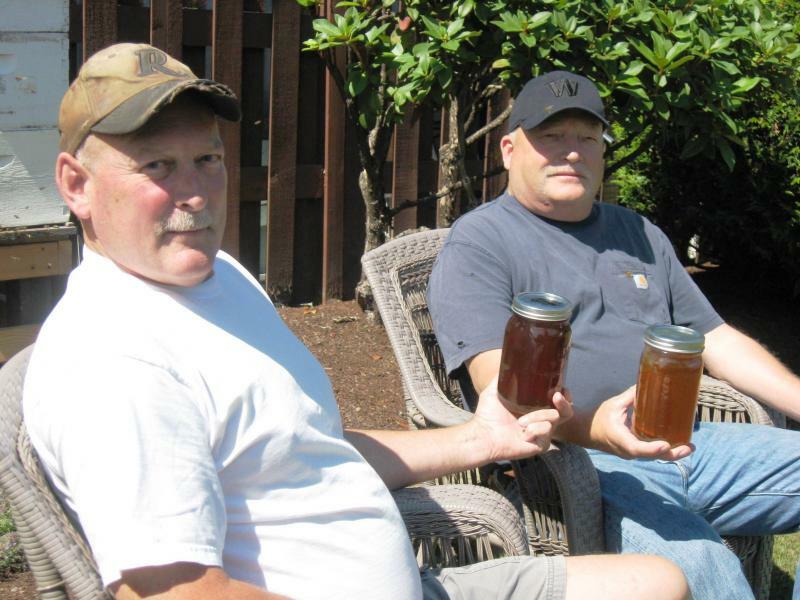 Above, Kevin & Grant will serve no honey before its time....below, new LCBA members Sherri Underhill & Randy Duncan with their 2nd-prize winning amber honey ~ nice work for their first honey harvest! Above, volunteer Mike Helms looks on as visitors make their way around the tasters. Above & below, tasters react to different flavors: everyone's palate is different (& that's ok!). . . Above, close-up of Kevin's & Grant's prize-winning honeys.